Being a mommy can be exhausting and we all need reminders to take care of ourselves, breathe, take a moment, examine our priorities etc. That is why I am loving these Infinity Charm Necklaces from Rejuvenation Gifts. 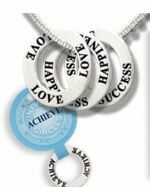 First pick your chain length and style and then choose your message to inspire yourself of a friend.There are dozens of messages to choose from. One other nice part? They don’t cost a fortune. Necklaces (with two charms) start at only $20 and you can add additional charms for $5 each. So no need to practice your Lamaze breathing when you pay for this purchase! Take a minute while you are on the Rejuvenation Gifts site to check out their upcoming retreats and other gift packages for busy moms like us. Looks like a dream vacation to me! them by hand. Jewelry store setups have evolved their looks with more sophistication and chic. Jewelry photography is a challenging photography technique that requires both knowledge and skill.